Our large format digital printing technology is perfect for producing very large printed hoarding panels for outdoor use for example at the entrances to, or around entire, construction sites and new housing developments. We can print standard 8ft x 4ft panels individually or create continuous displays as long as you need. Producing really big graphics can be daunting, it’s not easy making sure designs work across lots of panels and uneven surfaces but don’t worry, we are here to help. We’re really flexible and are happy to either work with your design and fitting teams, or if you prefer we’ll manage the entire project for you. There are a number of significant advantages to using printed hoarding boards. Firstly the cost of producing these big displays is very economical when compared with other large format graphics. They are sturdy and secure and can be made using a selection of hard-wearing materials including Dibond, Correx or Foamex. We are also able to apply anti-graffiti protective lamination to the dibond hoardings we produce which keeps them looking smarter for longer. We really love helping clients maximise the impact of their printed hoardings. There’s quite a bit involved to make sure these big designs work perfectly – especially when you bear in mind how much gradients can vary across a site. Don’t hesitate to get in touch if you want to chat through how best to produce your hoarding artwork. These large format printed advertising graphics can be used individually or linked together to form outdoor displays many meters long. Some of the hoardings we’ve produced have been hundreds of meters! Be assured that however big or small your hoarding project is you’ll be in safe hands because CSDPrint’s installation teams are fully trained and insured. If you are setting up a new construction site, printed single large format hoardings are an excellent way to smarten up the entrance. Bold, high definition images will clearly identify the site and help promote your company and the development too. Single panels are also often used as site safety signs. Because we know how important onsite safety is, we work closely with our construction clients to help them design attention grabbing health and safety graphics. Continuous hoardings around the perimeter of a construction site or redevelopment not only keep the site safe and secure but also provide an excellent, high impact advertising opportunity – there’s such a lot you can tell your customers with all that space to play with! Many of our estate agent clients and property developers use a combination of single hoarding displays and continuous or linked panels. Often single printed panels are used to welcome prospective buyers to the new housing development and to promote the show house whereas several joined panels are usually placed in prominent locations around a site, for example along a busy roadside. Whether you are ordering a single panel or a whole site perimeter hoarding system we are here to help you. We will visit your site, measure up and advise you on the design and material, as well as print, deliver and install everything for you. We can do as much or as little as you need us to. 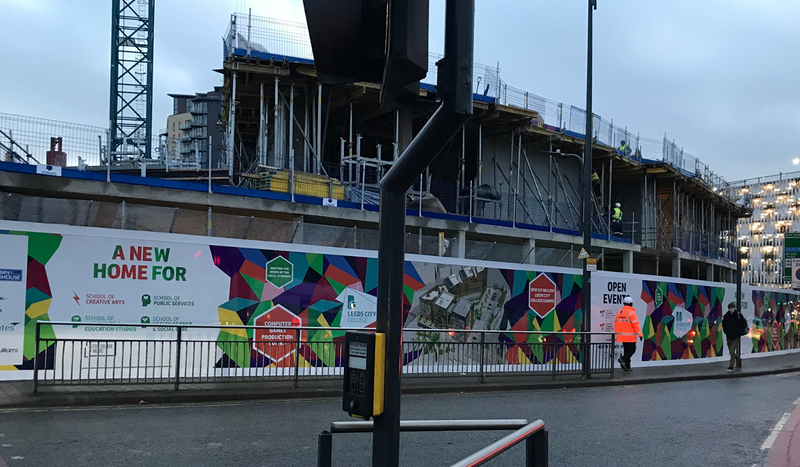 CSDPrint erected 135 printed hoarding panels around the perimeter of a £57m new college development in Leeds city centre. A team of four from the company were on-site for three days fitting the branded safety panels along 165 meters of the site adjacent to one of Leeds’ busiest roads. Printed onto robust, weatherproof Dibond with anti-graffiti lamination, the hoarding featured the college’s distinctive branding. Due to the varying gradient of the site CSDPrint was required to carefully adjust the artwork supplied by the client. Commenting on the project, CSDPrint managing director, Stephen Harrison said: “It was fantastic to see these site hoardings going up, we’d done a number of large scale projects like this in other cities around the country but this was our first really big one on home turf.